NLM Reprint: Pentecost - The Grandest Octave? Time and tide are moving on and while Jeffrey and Gregory now step forward to take on their new roles here on NLM, for me it is the time for farewells. Thank you. Thank you to all who have given your support and encouragement over the years. Thank you to all of my fellow contributors. Thank you to all of you who have collaborated behind the scenes with me (you know who you are). I wish each and all of you all the very best, and I bid you all a fond farewell. 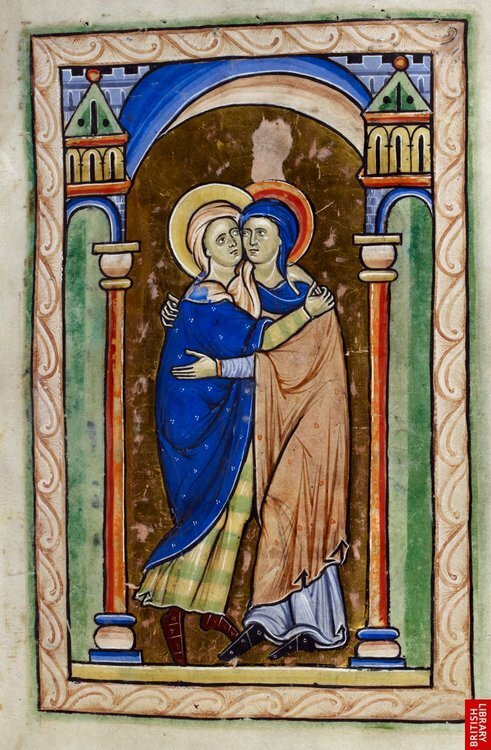 In today's Office of Readings, on this day of the Feast of the Visitation, the first reading is from the Song of Songs. It seems to have been a common theme in late medieval art to portray Mary interpreted as the 'Garden Enclosed' as referred to in the Song of Songs. As someone who loves gardens I like the idea of the garden having a place in sacred art. (I am talking here of the garden grown for beauty, the 'flower garden' as it would be called here in the US). I am not aware of this being a common subject for artists to paint today and one wonders why? The first answer that comes to mind, almost as a kneejerk response, is that genuine piety for Mary has declined and this is just one more casualty in the devotional lexicon. It might be this, but also, I wonder if it is not a reflection also of a different attitude to gardens and to man's place in creation. Here are some personal thoughts about this in this regard. As ever when I stray into personal thoughts, I expect there will be NLM readers who are more knowledgeable and wise and so would love to see comments on the place of this genre in sacred art today. Historically, as I understand it, the wilderness was seen the place of untamed nature which is the home of the devil. Christ went to meet him there for 40 days and when monks and hermits went out to the desert, it was not, so I have have been told, to escape the city, but rather to engage in spiritual battle in the wilderness, the lair of the enemy. In the painting below by the Flemish artist Robert Campin, we see the father of monasticism, Anthony Abbot (with St Catherin of Siena, John the Baptist and, I think, St Barbara), now resting in the garden having completed, one presumes his spiritual battles in the Egyptian wilderness. the beauty of nature cultivated. Here in the US where people particularly prize their national parks as places of wilderness unaffected by man. They are wonderful places to visit and very well run. but I am always struck by the fact that they do not preserve the beauty of farmed land. In the UK, where I come from there is no part of the land, as far as I am aware, that is not man-affected, yet I miss the beauty of its countryside very much. Our national parks, such as the Lake District, are preserving traditionally farmed beauty. The wilderness is beautiful, but it is part of a fallen world and we know objectively that by God's grace man can raise the beauty of nature up to something higher than the wilderness (he is also capable of destroying its beauty too we must remember when attempting to make a judgement on this). The second point that arises in my consideration of this is the question as to whether or not gardening is a male or a female passtime? Talking to many here in the US, the impression I get is that people see planting vegetables or rearing animals for food as a masculine thing; but growing a garden for its beauty? Definitely not. As a general rule, amongst the students, here, the young men are interested in activities linked to rearing chickens, keeping bees or growing vegetables, but growing flowers? No. In response to this I would say that Adam was a gardener and Christ, the new Adam, was mistaken for a gardener; and the garden was the place that He went to to pray to his Father. Also, while Mary is identified with the garden, it was the man in the Song of Songs who cultivated the garden and gathered lilies for his love. Furthermore, my great grandfather was head gardener of the Duke of Northumberland (so the family lore goes); my grandfather was and my dad still is a very keen amateur gardener (my father's garden was even featured once on national television). I don't expect my citing of family members to persuade many, but it speaks eloquently to me - all were men! Aristotle it seems to suggest that the natural home for man is the city in close association with others and scripture seems to support this. In psalm 106 the city is the place of culture from which the wilderness is banished and in the Book of Revelation, our final home will be the city of the New Jerusalem; but this is a garden city in which the Tree of Life flourishes and Eden has been restored by Christ the Head Gardener. So perhaps we can conclude from this that the garden is a place of beauty, a retreat for relaxation and contemplation for city dwellers. In the biblical references I have found it is a place in which everything is grown for its beauty and to delight the senses - taste, smell, vision - rather than simply sustenance. 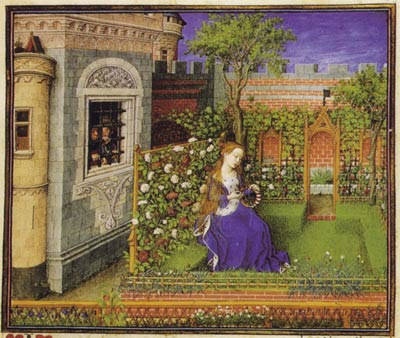 The little bit of reading about medieval gardens seems to suggest that, consistent with this, they were designed with both utility and beauty in mind (just as with architecture it seems, utility and beauty are seen as two aspects of what is good). By this the work of man adds harmony to the hymn of the cosmos in proclaiming the glory of God. Leo XIII said in his encyclical Rerum Novarum, that men (I assume here in the sense of all humanity) should be encouraged to cultivate the land and in so doing will, 'learn to love the very soil that yields in response to the labor of their hands, not only food to eat, but an abundance of good things for themselves and those that are dear to them [my emphasis].' In advocating that men grow flowers I am not suggesting that this is part of discover of their 'feminine side'; rather, that the cultivation of beauty for contemplation should be seen as much a masculine occupation as a feminine one. Perhaps there are parallels here with the feminization of prayer and contemplation that has lead to a drop in the number of vocations. Maybe the antidote lies with fathers - what we need here is fathers who not only lead the family in prayer, but are happy once again cultivate natural beauty as an example to their sons...even if it is only watering a window box to grow the flowers to give to his wife! 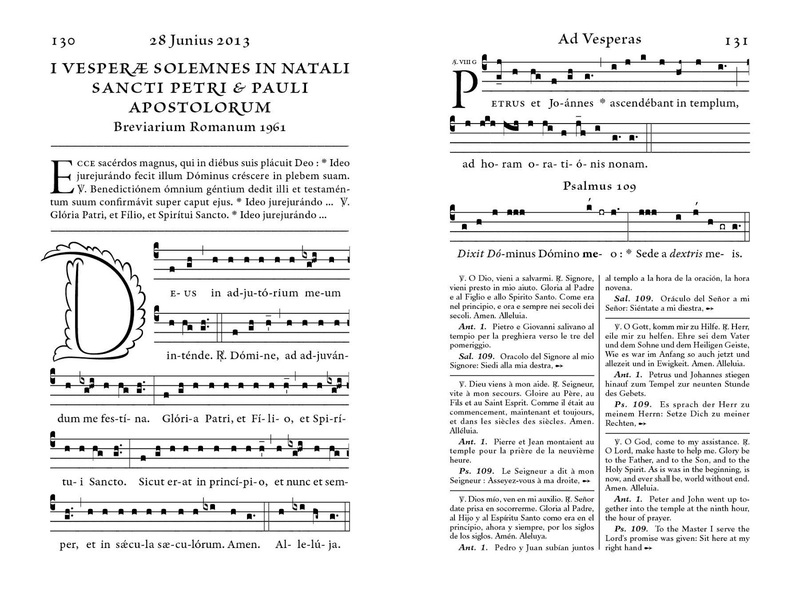 In the Pontifical of 1595, the bishop wears a white cope and simple miter for the solemn blessing of an image of the Virgin Mary, which begins as usual with “Adjutorium nostrum” and “Dominus vobiscum”, followed by the collect of the Annunciation. Let us pray. O God, Who didst will that Thy Word should, by the message of an Angel, take flesh in the womb of the Blessed Virgin Mary, grant unto us, we beseech Thee, that all we who do believe her to be truly the Mother of God, may be helped by her intercession before Thee. Through the same Christ our Lord. R. Amen. Ant. Under thy protection we seek refuge, Holy Mother of God; despise not our petitions in our needs, but deliver us always from all dangers, glorious and Blessed Virgin. The antiphon is sung with Psalm 86 Fundamenta ejus, the sixth of Matins of the Virgin; in Eastertide, the antiphon is substituted by another, which is simply the words “Alleluia, alleluia.” There follows a second antiphon, the second of Lauds of the Annunciation, which is sung with Psalm 122 Ad te levavi. Ant. Hail Mary, full of grace, the Lord is with thee; blessed art thou among women, alleluia. 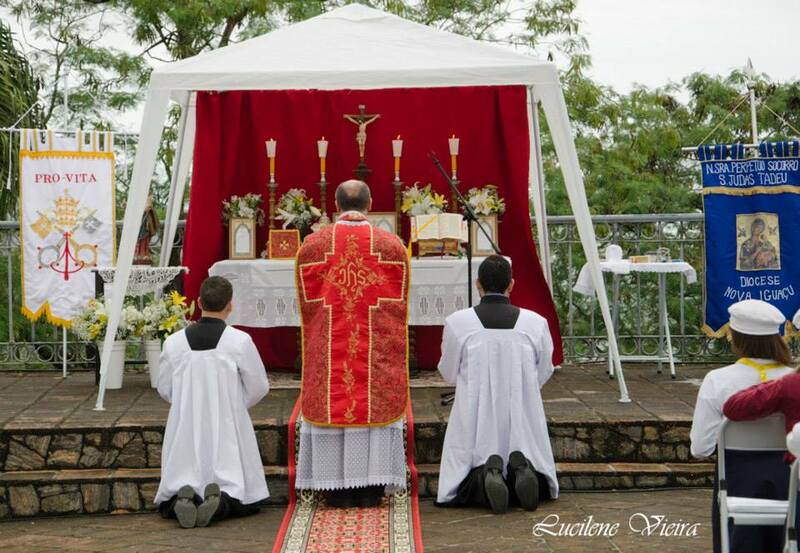 The bishop says the following prayer, the collect of the vigil of the Assumption. Let us pray. O God, Who deigned to choose for Thy dwelling-place the virginal palace of the Blessed Mary, grant, we beseech thee, that Thou may shield us by her protection, and make us glad in her commemoration. Who livest and reignest etc. Ant. 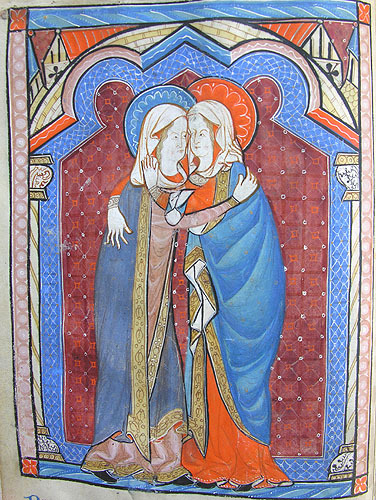 O glorious Mother of God, ever Virgin Mary, who didst merit to bear the Lord of all, and alone of all virgins suckle the King of Angels, kindly remember us, we beseech thee, and pray for us to the Lord Jesus Christ; that we, supported by thy patronage, may merit to come to the kingdom of heaven. The bishop then says two prayers; the first is a repetition of the collect of the Annunciation noted above, the second is as follows. At the places marked with crosses, he makes the sign of the Cross over the image with his hand. Finally, he sprinkles the image with holy water again. In the revision of 1961, the bishop wears a white cope and the “auryphrigiata” miter, rather than the simple miter. 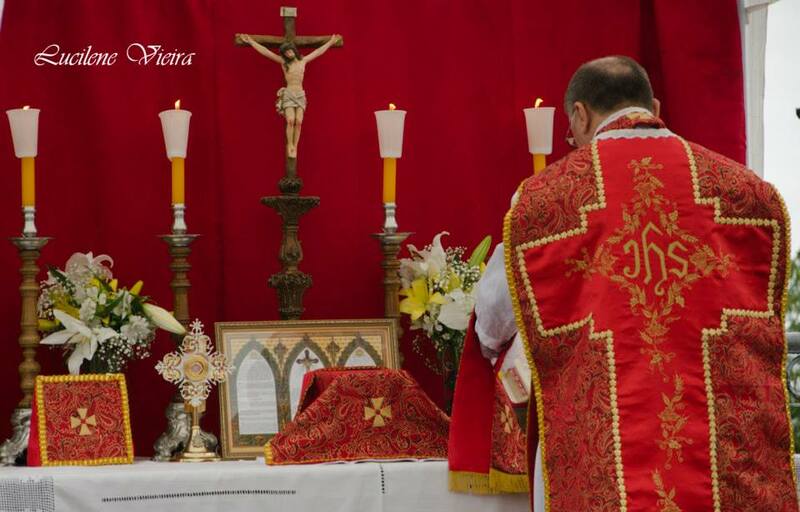 The blessing begins as usual with “Adjutorium nostrum” and “Dominus vobiscum”, and the following prayer. The words noted here in italics are omitted from the previous version in the Pontifical of Clement VIII. The words “take on the flesh” noted in bold represent the change of “incarnari” in the previous version to “carnem assumere” in Latin; the word “image” noted in bold is changed in Latin from “effigie” to “imagine”, but means the same thing. The words noted in parentheses are in Latin “de commissis et omissis” in the 1595 version, which is changed to simply “de commissis”. 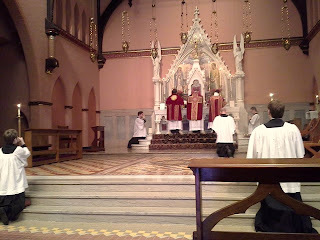 The bishop sprinkles the image with holy water, and then places incense in the thurible and incenses it. The Magnificat or “a popular song” is sung as he does this. All the other prayers and chants noted above in the Pontifical of Clement VIII are suppressed. FYI, the liturgical journal Antiphon has made a number of articles from volume 15 of that journal now available online. Do go and take a look. Corpus Christi is a medieval latecomer to the Church year, and this may be the reason why different languages have different names for it. 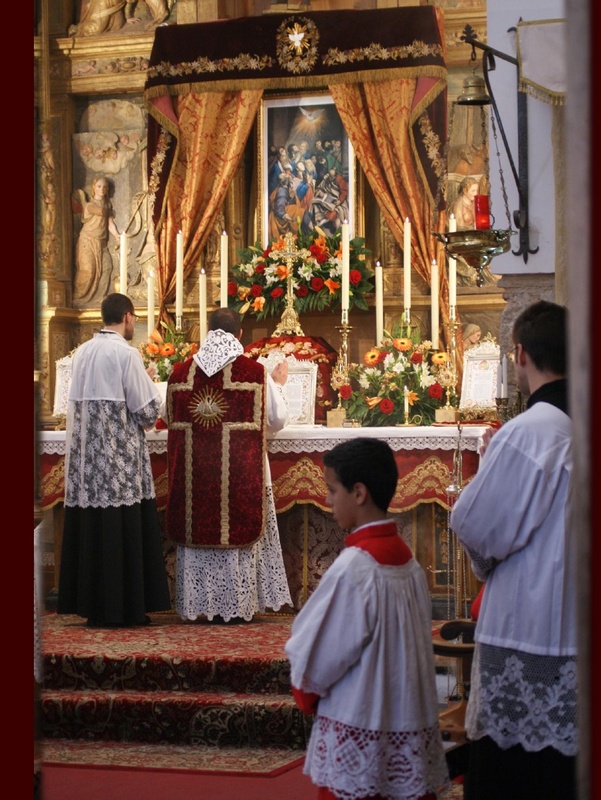 In English and Spanish, it is traditionally called ‘Corpus Christi’, but in Italian ‘Corpus Domini’, (as we see in the opening title of the video), in French, ‘Fête-Dieu - God-feast’, or more freely ‘feast of God,’ and in Polish ‘Boże Ciało - Body of God’. In German, it is called ‘Fronleichnam’, a literal translation of ‘Corpus Domini’. This is a compound of the Old German word ‘Vrone - Lord’, and ‘Leichnam - body’, and has been retained as a traditional name for the feast even though ‘Leichnam’ has come to mean ‘corpse’ in Modern German: not the result of theological carelessness, but a reminder that the Eucharist is also a “memorial of the death of the Lord”, as St. Thomas says in the hymn Adoro te devote. In the Ordinary Form, the formal Latin title of the feast was changed to ‘The Solemnity of the Body and Blood of Christ’; the words ‘and Blood’ were added when the Feast of the Precious Blood was removed from the General Calendar, the most widely protested such removal. These are the words of Bishop Dominique Rey, Convenor of Sacra Liturgia 2013, in his Introduction to the book containing the liturgical services for the conference currently being printed. 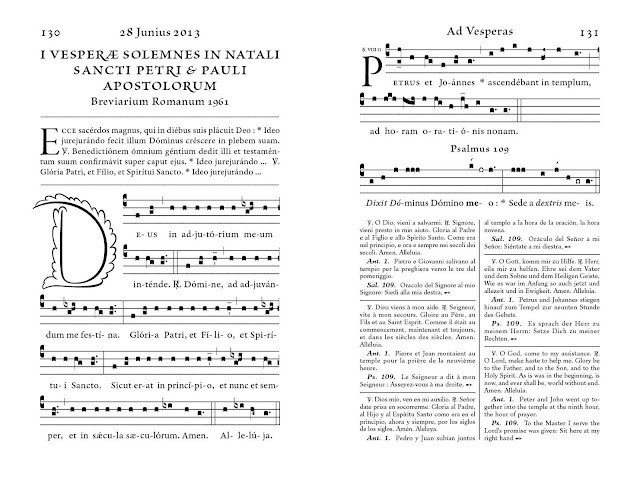 The four pontifical liturgies at the conference will be celebrated in Latin, with Gregorian Chant having pride of place. Silverstream Priory, Co. Meath, Ireland, have completed the typesetting of the liturgy book (pictured) which gives the chant notation, liturgical texts and translations in each of the five languages of the conference so as to enable active and actual participation. Sponsors Arte Grande have facilitated the printing of this book in hardcover with ribbon markers. Both have ensured that delegates will have in their hands a volume that truly befits the dignity of the Sacred Liturgy. 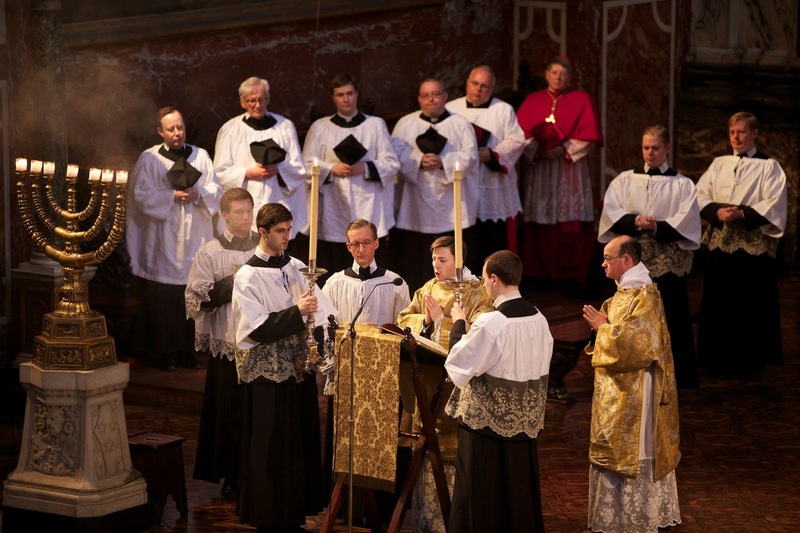 The Rome-based Schola Polifonica Sacri Montis will sing at all four conference liturgies. The music includes Victoria’s ‘Ave Maria,’ ‘Adoramus te Christe’ by Orlando di Lasso, ‘Domine non sum dignus’ of Tomas Luis de Victoria, Gregorian Mass II (fons bonitatis), Giovanni Pierluigi da Palestrina’s ‘Missa sine nomine,’ 'O sacrum convivium’ by Giovanni Croce, Palestrina's 'Dominus Jesus in qua nocte,’ Perosi’s ‘O Salutaris Hostia’ and Victoria’s ‘Tantum Ergo.’ The conference will conclude with the singing of the Laudes regiæ. The Conference liturgies are open to delegates registered for the afternoon session in which they occur. 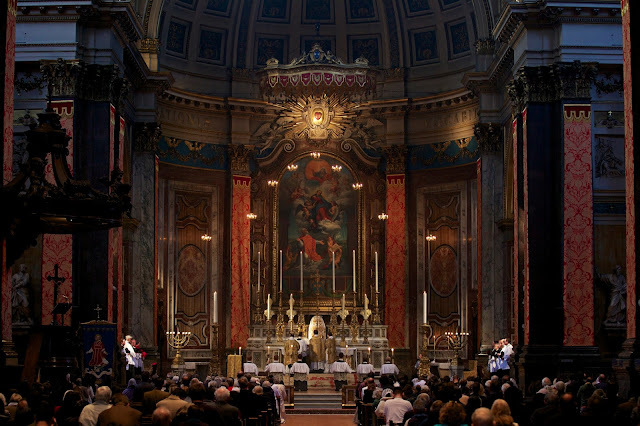 I'm very pleased that in my last week of blogging I get to share some photos from the London Oratory, and on St. Philip's day no less, courtesy of Charles Cole. 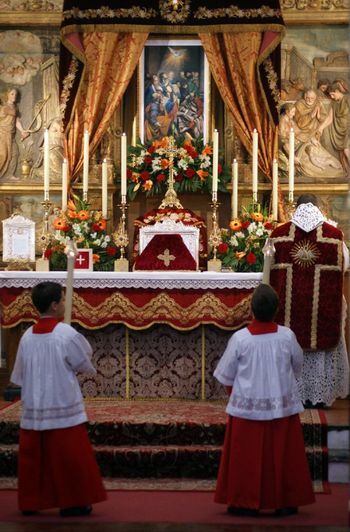 Since the election of Pope Francis we have consistently commented that the resignation of Benedict XVI did not mean the end of the new liturgical movement; not in any way whatever in fact. 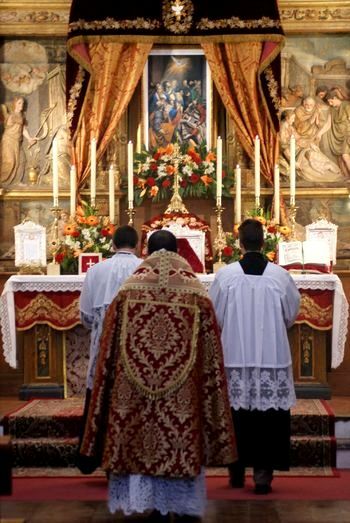 In the same vein, more than once have we commented that we believe it was rather unlikely that any successor of Benedict XVI would unravel the advancements set forth in the motu proprio Summorum Pontificum. "Then it was the turn of the bishop of Conversano and Monopoli, Domenico Padovano, who recounted to the clergy of his diocese how the priority of the bishops of the region of Tavoliere had been that of explaining to the Pope that the mass in the old rite was creating great divisions within the Church. The underlying message: Summorum Pontificum should be cancelled, or at least strongly limited. But Francis said no. "Mgr Padovano explained that Francis replied to them saying that they should be vigilant over the extremism of certain traditionalist groups but also suggesting that they should treasure tradition and create the necessary conditions so that tradition might be able to live alongside innovation." This is not really a surprise (did anyone expect that Pope Francis would somehow "repeal" Summorum Pontificum?) but it is a welcome confirmation of what we would all expect. 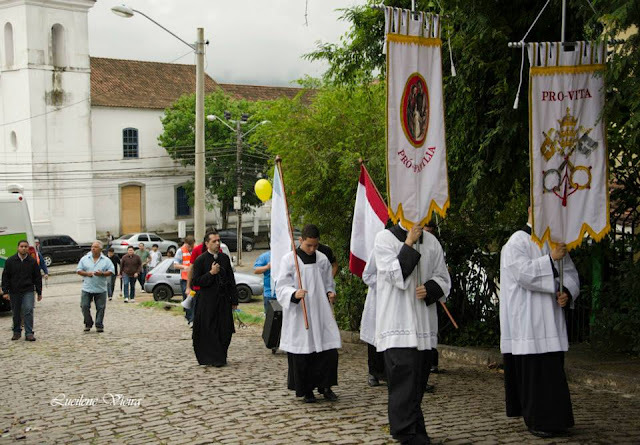 The Sacra Liturgia conference is one month away and the organizers say the registrations have so far been high. 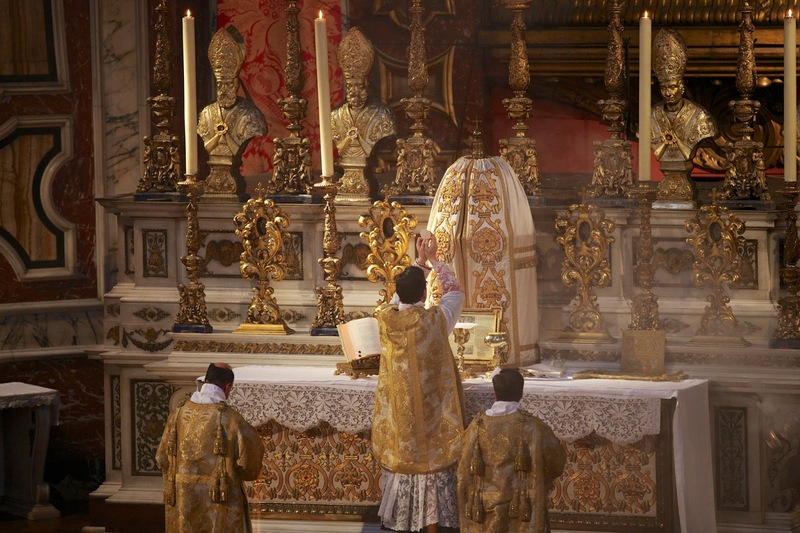 It is held in Rome and will explore every aspect of liturgy. You can find out more here. St. Philip Neri is associated with several churches in Rome, the foremost being of course Santa Maria in Vallicella, still usually called the Chiesa Nuova, the “New Church”, more than 430 years after the first Oratorians took up residence in the buildings attached to it. 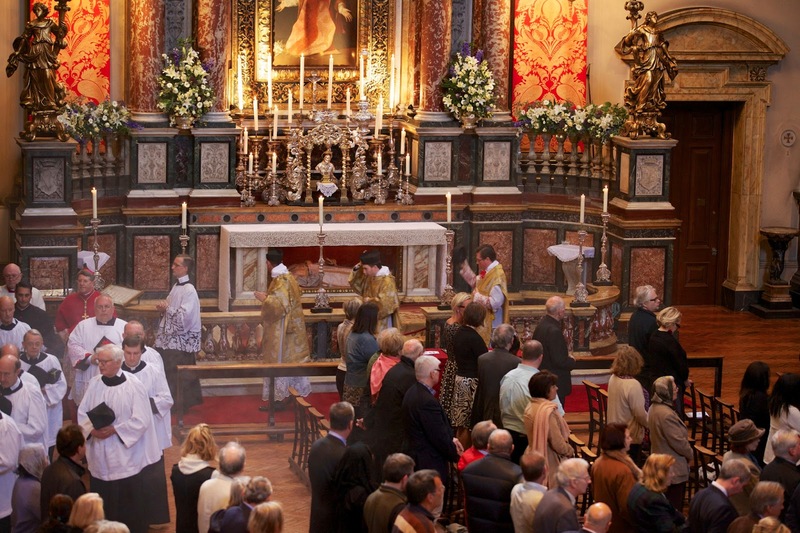 His body rests there in the altar of one of the most beautifully decorated chapels in the city. The current Roman home of the Fraternity of St. Peter, Santissima Trinità dei Pellegrini, was built on the site of an earlier church dedicated to St. Benedict; a confraternity founded by St. Philip to take care of pilgrims during the Jubilees was given the church in 1558, demolished it, and rebuilt it by 1614 as we have it today. Even after Chiesa Nuova had been completed, St. Philip himself continued to live at his old rooms at the church of San Girolamo della Carità, at equal walking distance from his spiritual sons at Chiesa Nuova, and the hospice at Trinità dei Pellegrini, where he was wont to wait upon the pilgrims with his own hands. His feast day, May 26th, is often caught in the midst of the several of the greatest of the Church year, Ascension, Pentecost, Holy Trinity, Corpus Christi and Sacred Heart. The Chiesa Nuova therefore often leaves up some of its best decorations for the whole of the period. 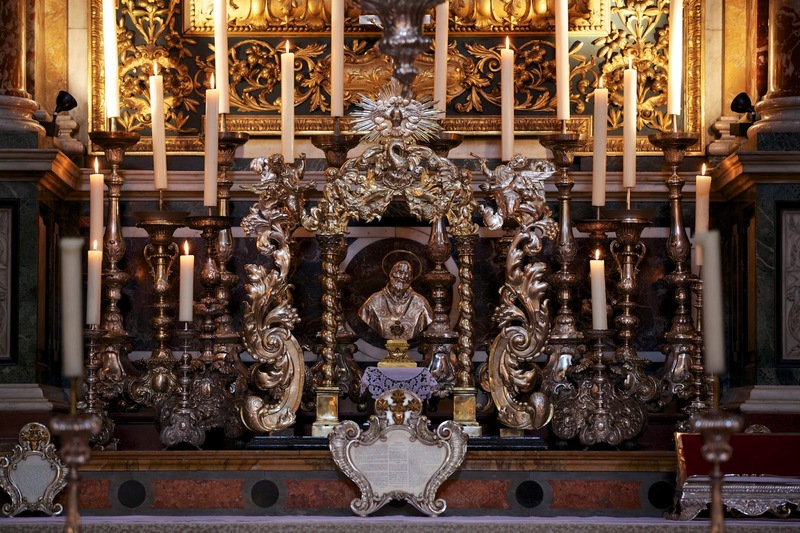 Of particular note are the red and gold drapes set over the engaged columns of the church; the use of such decorations was formerly very common in Italy, but Chiesa Nuova is now one of the few places where they can be seen in Rome. The outside of the chapel of St. Philip’s relics. A closer view of the underside of the organ which set over the door of the chapel. The altar of St. Philip, with a mosaic copy of Guido Reni’s famous painting of the Ecstasy of St. Philip. A closer view of the relics. The ceiling of the chapel’s atrium. The engaged columns of the nave covered in drapes. The Marian shrines commonly seen on the outsides of buildings are usually called “Madonelle - Little Madonnas” in Italian. This one, with St. Philip in the medallion below looking up at the Virgin and Child, sits on the via dei Pellegrini, a street which Philip would have frequently walked during the many years of his apostolate in Rome, going back and forth between the Chiesa Nuova, San Girolamo and Santissima Trinità. Well before his time, the street was laid out from the main area where pilgrims traditionally lodged in Rome directly to St. Peter’s, albeit by a rather circuitous route that brought them first to the Ponte Sant’ Angelo. The main altar of Trinità dei Pellegrini, with a silver bust reliquary of St. Philip. 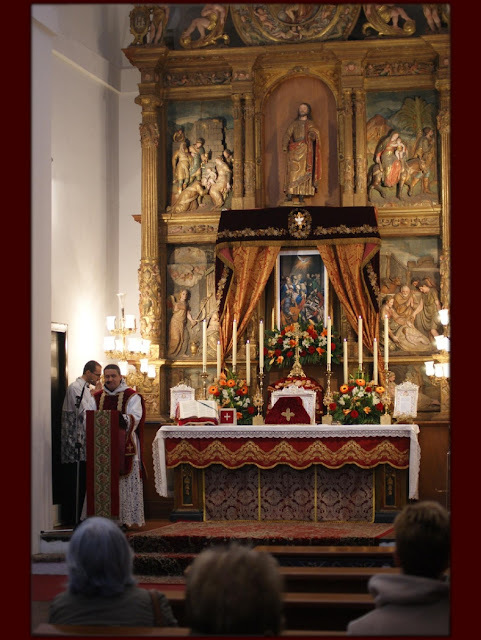 Readers living in Rhode Island and southeastern Massachusetts may be interested to know that a Missa cantata in the Extraordinary Form will be celebrated at historic Saint Anne's Church [website in development] in Fall River, Massachusetts, on Friday, June 7, the Feast of the Sacred Heart of Jesus, beginning at 7:00 PM. Completed in 1904, the Romanesque church (with Byzantine touches) stands at the corner of South Main and Middle Streets. Saint Anne's was a Dominican parish and priory until 1978; thus the large statues that line the interior along the church's nave depict a communion of saints who are especially revered by French Canadians or played an important role in the history of the Dominican Order. Brother (now Saint) André Bessette of Montreal occasionally attended Mass here when he was in town visiting relatives and benefactors. A large ambulatory with five projecting chapels encircles the sanctuary. The magnificent Casavant organ, installed in 1963, greatly enhances the grandeur of the sacred liturgy. 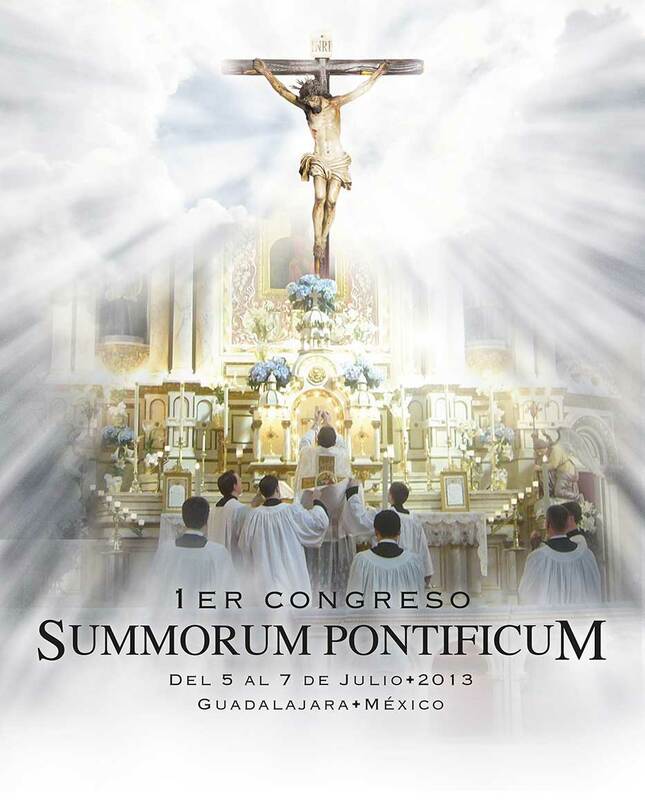 After similar events in other countries, there will now also be a Summorum Pontificum Conference in Mexico. The Conference will take place in Guadalajara from 5 to 7 July, and will conclude on Sunday 7 July with a Mass sung by the Archbishop emeritus of that city, Cardinal Sandoval Íñiguez. 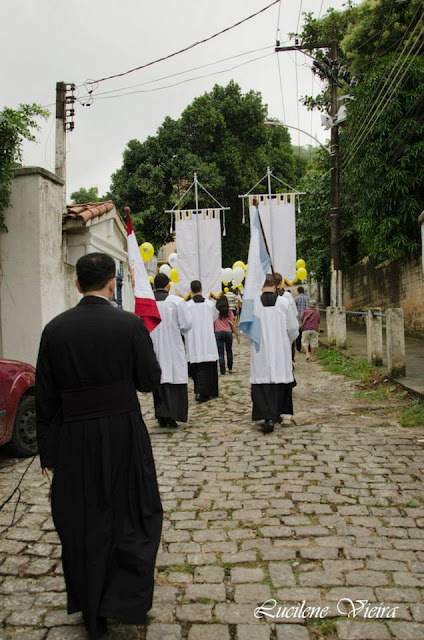 There will be ten different talks - Fr de Andrade FSSP, an official of PCED, will be among the speakers. 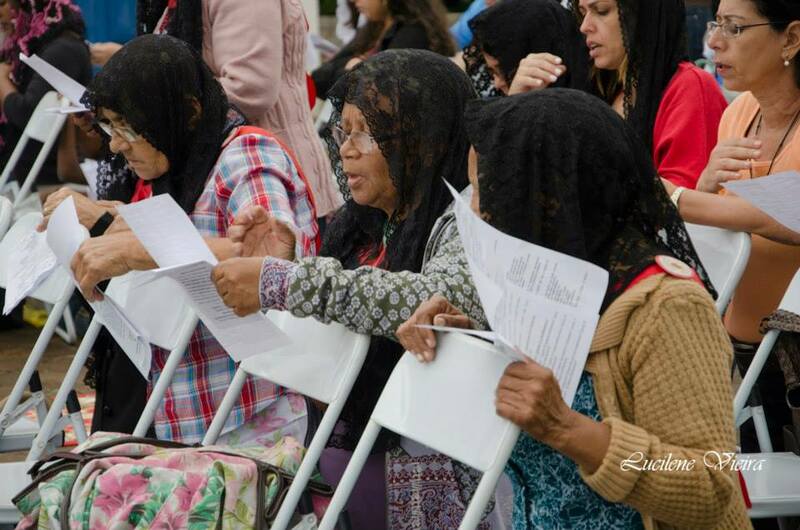 During the conference, there will also be solemn Vespers, as well as the opportunity to venerate Our Lady of Zapopan as well as the Mexican Cristero martyrs. Find out more at the site of the Mexican FSSP. Corpus Christi Watershed is continuing its interview series which intends to raise awareness around the role of the Propers of the Mass, this time with Fr. 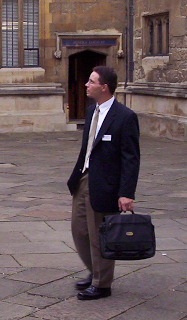 Guy Nicholls of the Birmingham Oratory. Following on from a recent look at the significance of the number eight in the liturgy, here is an example of geometric art that incorporates this symbolism. 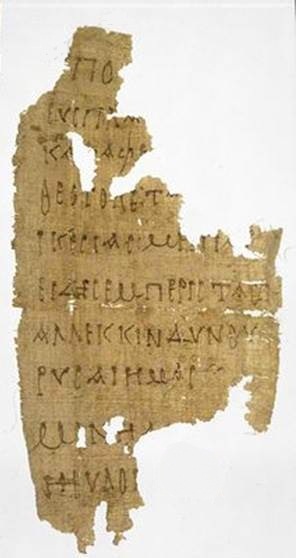 I discovered these images on the British Library website (which is wonderful resource for images of ancient manuscripts). These are from a 14th century gospel of St Luke made in the Holy Land. It strikes me as a faceted variation on the traditional 'quincunx' design in which four circles spin out of one central circle. This shape has its roots in pre-Christian Roman culture, and then was adopted in Christian art, East and West. 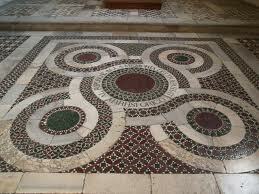 I wrote about this in an article 'The Quincunx - a Geometric Form of Christ in Majesty'. I do not have information about the intentions of the artist, so am giving a personal interpretation here. This design seems to be loaded with an additional symbolism by using octagons rather than circles in the basic quincunx design, which has a fourfold symmetry. Four symbolises the world and four gospels were chosen by the Church so that the Word was carried to the four corners of the world by the four evangelists, each evangelists is symbolised by the four figures described as sitting around the throne of Christ in the book of the Apocalypse. Eight, many will remember, corresponds to the eighth day of Creation that ushers in the new covenant: the incarnation, death, resurrection of Christ. Sunday is the eighth day of the week. In the basic repeat unit, which is repeated like floor tiles, we have, geometrically portrayed, four versions of the Word in the gospels (four small octagons) spinning out of one large one, the Creator himself, enthroned and in glory. 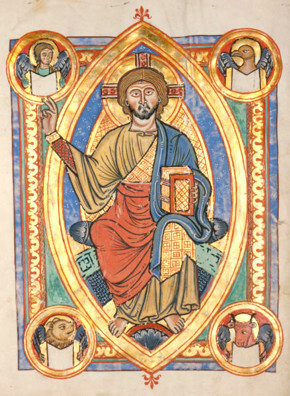 This might be considered a geometric representation of the Christ in Majesty (also called Christ Enthroned) in which his emissaries, the Angel, the Lion, the Ox, and the Eagle representing the four evangelists, are shown pictorially taking the Word out to the world.. When you have four of the repeat units combined, there is long-range order which has a fourfold symmetry in which four large octagons surround the central, which is the broad design of this 'carpet page'. 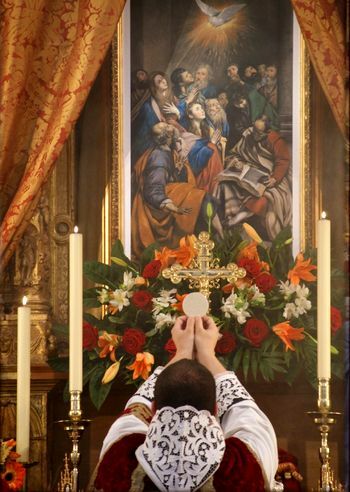 There is a beautiful harmony to this, and it seems to me to reinforce the superabundant truth of Eucharist: that through the propagation of his gospel in a literary description of his life, Christ in Majesty is really made present in the world in the liturgy of His Church. As I mentioned, this is my personal meditation upon what I am seeing, so I could be reading more into this than the artist intended. 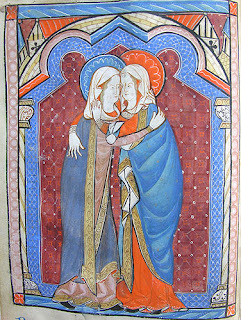 However, as an artist, I would happily reproduce this design with the intention of incorporating this symbolism into it..
Fresh off heels of the news and photos of the famed Chartres pilgrimage in France, one of our readers sends in news of another Pentecost pilgrimage, the "Peregrinación Totus Tuus", which begins at the Santuario de Nuestra Señora de Loreto and finishes at the church of Nuestra Señora de la Peña in Jacarepaguá, Río de Janeiro, Brazil. Fr. 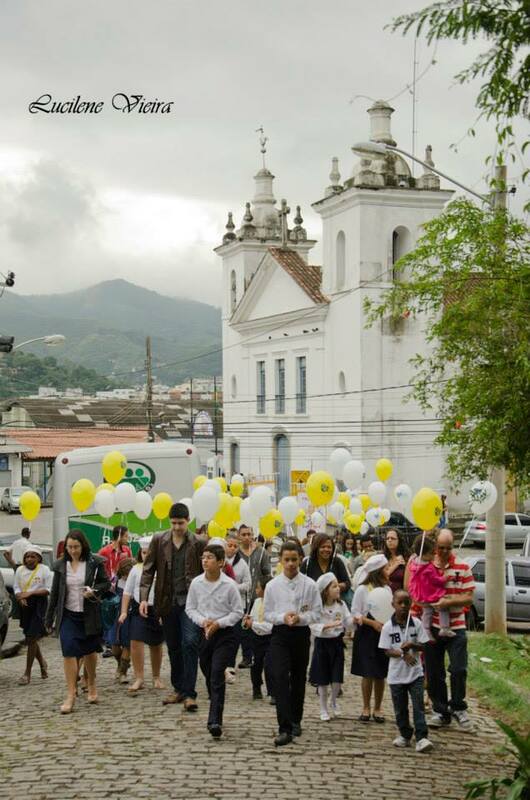 José Edilson Lima of the Apostolic Administration of St. John Mary Vianney celebrated Mass (usus antiquior) outside of the latter. Here are a few photos. 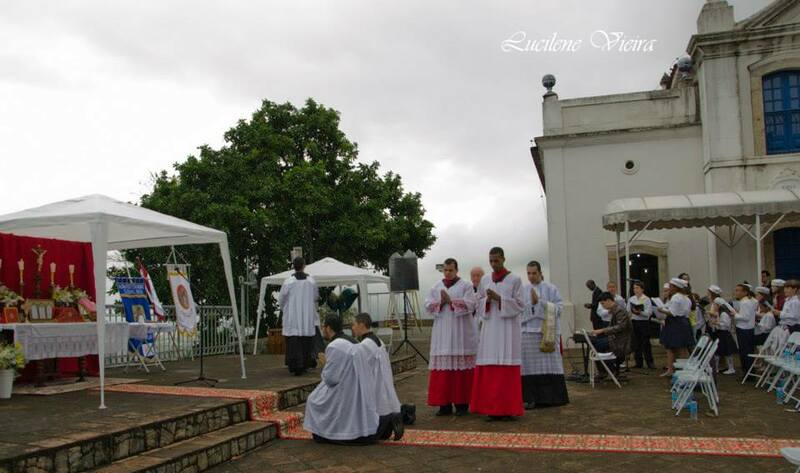 The person receiving the cross kneels before the bishop, who begins the blessing as usual with “Adjutorium nostrum” and “Dominus vobiscum”, followed by this prayer. At the places marked, he makes the Sign of the Cross with his hand over the pectoral cross. Almighty God, who didst dedicate the sign of the Cross by the precious blood of Thy Son, and who through the same Cross of Thy Son our Lord Jesus Christ, didst will to redeem the world, and through the power of the same venerable Cross delivered the human race from the decree of the ancient enemy (Colossians 2, 14); we humbly beseech Thee, that Thou deign with Thy paternal goodness to bless + this cross and impart to it the power and grace of heaven; so that whoever shall bear it upon himself as the sign of the Passion and Cross of Thy Only-Begotten Son, for the protection of his body and soul, may also be able to receive the protection of Thy blessing. * Just as Thou didst bless the rod of Aaron to drive away the faithlessness of the rebels (Numbers 17), so also bless + Thou this sign with Thy right hand; and against all the wiles of the devil, lay upon it the power of Thy defense, that it may confer upon those who bear it prosperity of salvation in both soul and body, and multiply in them the gifts of the Spirit. The bishop sprinkles the pectoral cross with holy water, and then says the following prayer over the one who will receive it. Lord Jesus Christ, son of the living God, who art the true and almighty God, splendor and image of the Father, and life eternal; who proclaimed to Thy disciples, that whoever would come after Thee must deny himself, and taking up his cross, follow Thee; we ask Thy boundless clemency, that Thou protect always and everywhere this Thy servant, who according to Thy word, desireth to deny himself, and take up his cross, and follow Thee, and for the salvation of Thy chosen people hasten to fight against our enemies; deliver him from all dangers, and release him from the bond of sin, receive his vow and bring it to the desired effect. Do Thou, o Lord, who art the way, the truth and the life, and the strength of them that hope in Thee, guide well his way, and grant him all success; so that amid the difficulties of this present age, he may be ever directed by Thy aid. Send to him, o Lord, Thy angel Raphael, who was the companion of Tobias on his journey, and delivered his father from bodily blindness; as he cometh and goeth, may he be his defender against all the snares of the enemy, visible and invisible, and drive from him all blindness of both mind and body. 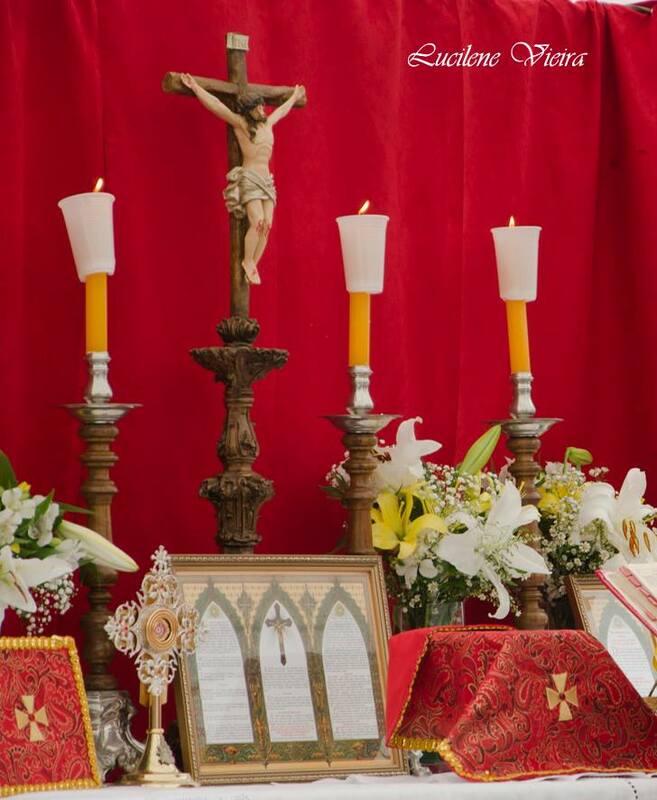 Receive the sign of the Cross, in the name of the Fa+ther and of the + Son, and of the Holy + Spirit, as a figure of the Cross, the Passion and the death of Christ, for the defense of thy body and soul, that by the grace of the divine goodness, thou may return to thine own safe and reformed when thy journey is completed. (The word “reformed” in this prayer refers to the fact that people were often sent to fight for the defense of Christian lands as an act of penance for serious sins.) 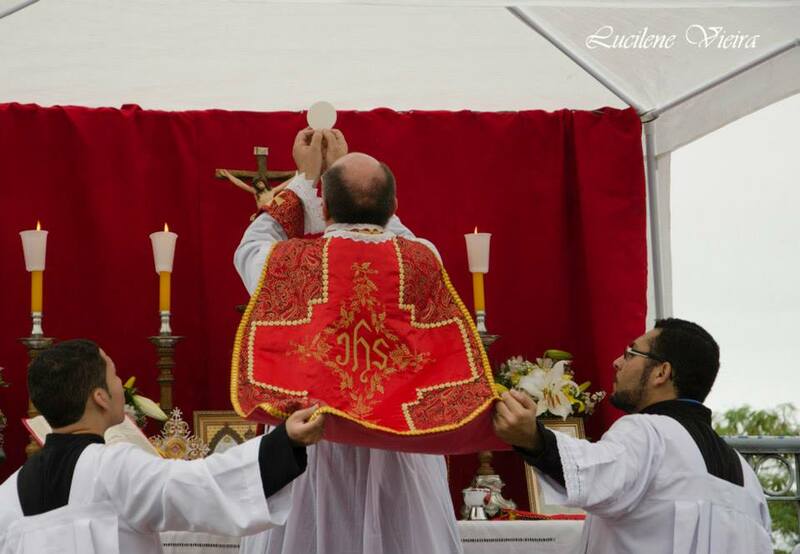 Finally, the one who has received the cross kneels before the bishop, is sprinkled by him with holy water, and then kisses the bishop’s hand and departs. 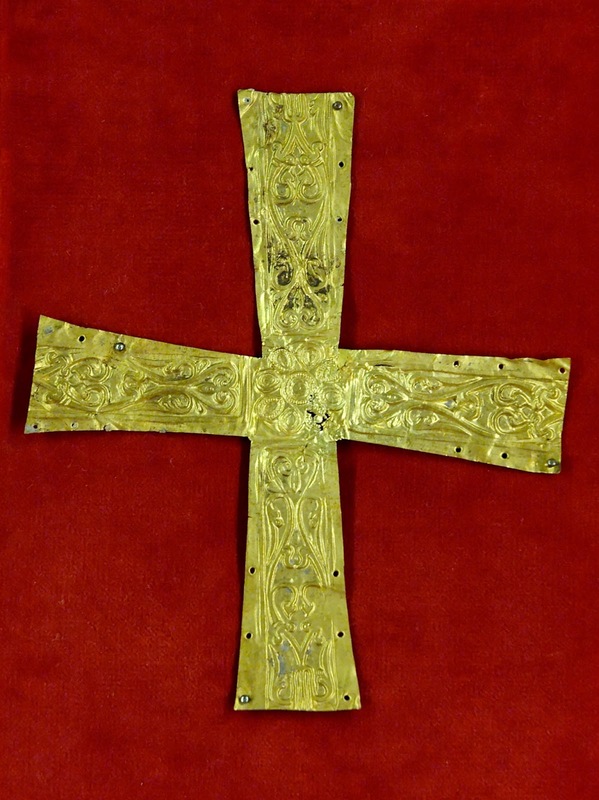 In the revision of 1961, the blessing is retitled “The Blessing of a Pectoral Cross”. No reference is made to the person who will receive the pectoral cross, or to the imposition of it upon him by the bishop. It begins with “Adjutorium nostrum” and “Dominus vobiscum”, followed by the prayer “Almighty God, who didst dedicate the sign of the Cross…” noted above. The second part of the prayer noted above after the red star, (“Just as Thou didst bless the rod of Aaron…”), is suppressed. 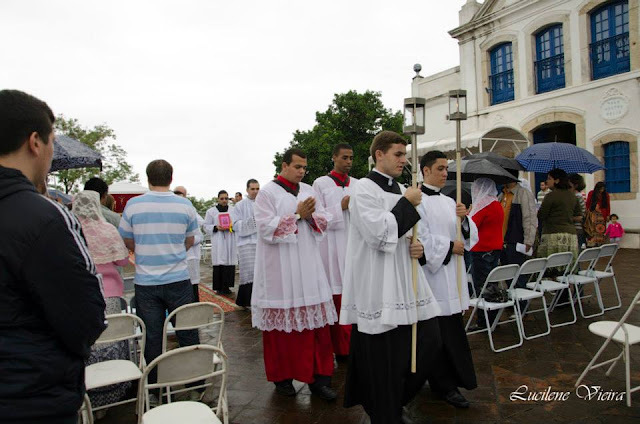 The bishop then sprinkles the cross with holy water; the second and third prayer, and all the rites accompanying them, are suppressed. A pectoral cross made in Italy ca. 600 A.D., now in the Musée national du Moyen Âge in Paris.